In retaliation for their activities in Venezuela and cooperation with United Nations and regional human rights bodies, a group of UN and Inter-American rights experts has underscored their condemnation at attempts by Venezuela’s State-controlled television to discredit and intimidate rights activists. In a press release the experts drew attention to what they see as systematic targeting of human rights defenders through a weekly TV programme, Con el Mazo Dando, transmitted by the State network, Venezolana de Televisión. In an apparent aim at intimidation, the host, President of the Venezuelan National Assembly, Diosdado Cabello, pitches on-air accusations against rights activists and civil society organisations. The network also publishes personal information on its website. “It’s high time to pull the plug on this shameful and televised harassment of rights activists in Venezuela,” the experts declared. 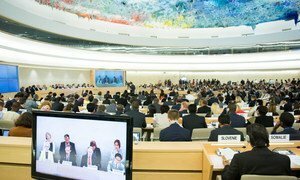 Recalling that United Nations and Inter-American human rights bodies are charged to monitor Venezuela’s implementation of its international and regional human rights obligation, the experts point out that the Government is bound to respect and defend the rights activists’ participation in those proceedings. “Any act to thwart such engagement, be it on- or off-air, directly contravenes international human rights law,” they stressed. While 70 years of work by the United Nations has helped build a formidable system of rights protections, the nagging persistence of “everything else” – wars and ongoing deprivation – is deeply worrying, the top UN human rights official declared today, urging renewed action to promote economic and social rights for all and tackle pervasive discrimination and repression.